A super-loud brass rattle in the NO-SNAGG Slip Sinker attracts fish to Lindy Rigs, Carolina Rigs, and other slip-sinker presentations—while remaining virtually snag-free! Rattles provide that "extra edge" when fishing in dirty, stained, or rough water. 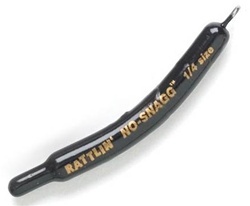 The Rattlin' NO-SNAGG Slip Sinker makes its rattlin' way through the snaggiest rocks, wood, and bottom vegetation!